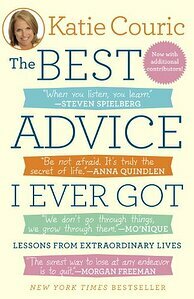 Katie Couric is not only a nationally renowned journalist – she’s also the New York Times bestselling author of The Best Advice I Ever Got: Lessons from Extraordinary Lives. She generously donated the proceeds from her 2011 book to Scholarship America to establish the Dream Award, a unique renewable scholarship program for financially needy students who have overcome barriers and successfully started their college education. This is only a sampling of the inspiring insights from leaders and visionaries in Katie’s book. Read it. Share your favorites too. Happy New Year! Pam Carlson is Scholarship America’s Communications Director.